Up to 1948 the town of Lomonosov was called Oranienbaum, and it is with this name many interesting pages of Saint Petersburg history are connected. At the beginning of the 18th century Peter the Great presented the vast territory on the shore of Finnish Gulf to duke Alexander Menshikov. For the construction of the residence Menshikov chose the territory to the west of Peterhof just opposite Kotlin Island. There the Great Palace, that surpassed in its sumptuousness even the palace of Peter the Great in Peterhof, was constructed and a park, one of the first regular parks in Russia, was laid out. The name Oranienbaum (that is German for an orange tree) reminds us of the whims of Menshikov, who liked to live high and spent freely on entertainments of all kinds. In his country residence Menshikov arranged a greenhouse for planting of all possible exotic trees, oranges among them. In 1727 Menshikov fell into disgrace — he was exiled to Siberia and all his fabulous property passed to the national treasury. In 1743 Empress Elizaveta Petrovna presented Oranienbaum to her heir — the future Peter III. Thus the new page in the history of Oranienbaum was opened. For the new owner the Great Palace was rebuilt and the ensemble was enriched with several new constructions. Among the most interesting ones the unique Poteshny (Toy) fortress Peterstadt that was specially built for the war-games of the small emperor should be mentioned. Unfortunately only the Gate of Honour designed by architect Rinaldi has preserved till nowadays. The present of the Empress turned to be fatal for Peter III. It is in Oranienbaum he learnt that his wife had dethroned him and shortly after he was throttled. 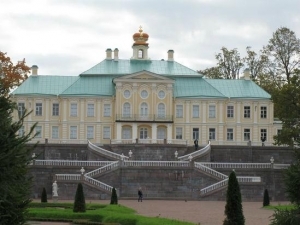 Under Catherine the Great the palace and park ensemble of Oranienbaum was reconstructed by architect Antonio Rinaldi. He designed the ensemble of the so-called «Personal Dacha» that comprised the splendid Chinese Palace, the Sliding Hill Pavilion and the surrounding Upper Park. Although the Empress spent a fortune on her new residence she rarely lived there. Soon after the revolution of 1917 the parks and palaces of Oranienbaum were nationalized and turned into a museum. In 1948 Oranienbaum was renamed Lomonosov. In fact, the outstanding Russian scientist Mikhail Lomonosov the town was named in honor of didn't have lot in common with Oranienbaum except for the fact that not far from the town he established a factory where colored glass and mosaic smalts were produced. Most likely the town was renamed to get rid of the odious German name that after World War II acquired many painful associations. Nowadays Oranienbaum is a state museum-preserve and, in spite of the fact that the restoration works are still on, the palace and park are an attractive sight for the citizens and guests of Saint Petersburg.